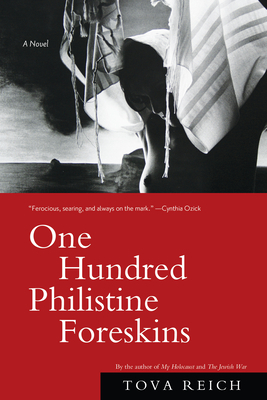 One Hundred Philistine Foreskins centers on the life of Temima Ba'alatOv, known also as Ima Temima, or Mother Temima, a charismatic woman rabbi of extraordinary spiritual power and learning, and an utterly original interpreter of the Hebrew Bible. Temima is revered as a guru with prophetic, even messianic powers--one who dares to raise her woman's "naked" voice even in the face of extreme hostility by the traditional establishment. Moving between two worlds--Temima as a child in Brooklyn and Temima as an adult in Jerusalem--the story reveals the forces that shaped her, including the early loss of her mother; her spiritual and intellectual awakening; her complex relationship with her father, a ritual slaughterer; her forced marriage; her "ascent" to Israel; and her intense romantic involvements with charismatic men who launch her toward her destiny as a renowned woman leader in Israel. True to Reich's voice as a satirist of humanity's darker inclinations, the story is rooted in contemporary times, revealing the extreme and ecstatic expressions of religion, as well as the power of religion and religious authorities to use and abuse the faithful, both spiritually and physically, with life-altering and crushing consequences. Cynthia Ozick said of Tova Reich that her "verbal blade is amazingly, ingeniously, startlingly, all-consumingly, all-encompassingly, deservedly, and brilliantly savage." This has never been more true than in One Hundred Philistine Foreskins, a work of literature sure to be hailed as an immensely authoritative and fearlessly bold tour-de-force. Tova Reich is the author of the novels My Holocaust, The Jewish War, Master of the Return, and Mara. Her stories have appeared in the Atlantic, Harper's, AGNI, and elsewhere. She is the recipient of the Wallant Book Award, the National Magazine Award for Fiction, as well as other prizes. She lives on the fringe of Washington, DC. "Out of Tova Reich's untamed imagination ferocious, searing, and always on the mark bursts Temima, a prophetess both majestic and vulnerable, her vision teeming with biblical champions, harlots, and sages, who ascends out of a mundane and hurtful Brooklyn to holy veneration in Jerusalem.